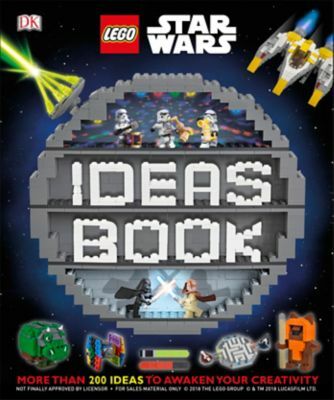 Inspire any LEGO® Star Wars™ fan with the LEGO Star Wars 5005659 Ideas Book. Featuring over 200 imaginative ways to build, play and create with your existing LEGO brick collection, this amazing 200-page, hardcover book will immerse any LEGO Star Wars fan in a galaxy of family-friendly play and fun activities. Design Darth Vader's family tree, customize a podracer, create a pencil pot shaped like your favorite character and much more! Price is 46% below the initial Lego retail price, a € 9.44 discount! The LEGO® Star Wars™ Ideas Book (5005659) Lego set is no longer directly available from the sites below. However, 3rd party partners of these sites might still have the set available. Alternate description Launch into a galaxy of LEGO® Star Wars™ ideas! This 200-page, hardcover book with full-color illustrations and images offers a wide variety of LEGO® building and game ideas based on the iconic LEGO Star Wars™ universe. Includes ideas such as a 10-brick challenge, hanging Star Wars™ planet mobile, Death Star desk decoration and Jar Jar Binks dominoes. This book is available in English at shop.LEGO.com. Measures over 10” (27cm) long and 8” (22cm) wide.